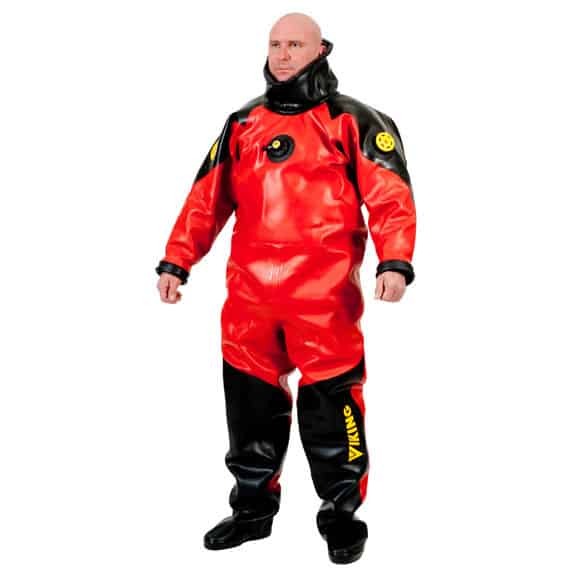 The Viking HD Drysuit is considered to be the industry standard for commercial diving worldwide. 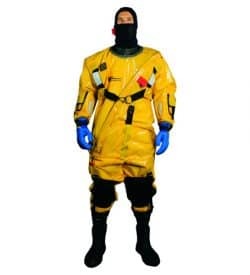 The suit material is as it suggests, heavy duty, built to withstand the rigors of diving in a harsh working environment. Whether the job is cleaning a ships hull, carrying out welding and inspection, or clearing a fouled propeller, the Viking HD is equal to these tasks and more. The Viking HD material is a blend of natural and synthetic rubbers (NR/EPDM), on a two way stretch knitted polyester lining. Total material weight is 1550 +/- 100 g/m2. Red with black reinforcements, or all black. Internal seams are stitched together with an elastic tape for security. External seams are vulcanized with a 25 mm rubber tape. Vulcanization is a chemical bonding process, ensuring watertight seams. Additional layers of anti slip textured rubber are applied to areas at risk of wear. The shoulders and zipper are reinforced. The front of the legs from above the knee, down to the boots, and around the boots are also protected from abrasion and puncturing. Bellows latex neck seal or neoprene neck seal. The suit may also be fitted with the Viking Quick Neck collar system, which allows for quick changing of broken seals.